I was briefly a nursing major in college. I still to this day think I would have enjoyed being a nurse, I just discovered the degree that I actually persued and realized I would enjoy it even more. As it turns out, being a mother and a farmer can give you many opportunities to be a nurse. Ayden's temp went back up a little today. It never got up to 102* but it was high enough for him to want to lay around all day and take THREE naps. He actually acted more puney today than he did when his temp was 103* over the weekend. His apetite was still normal and we played a little but for the most part, he just wanted to be in my arms. I called my sister and let her know I would not be in to teach dance and gave Ayden another sick, lazy, PJ day. We also had a sick hen. 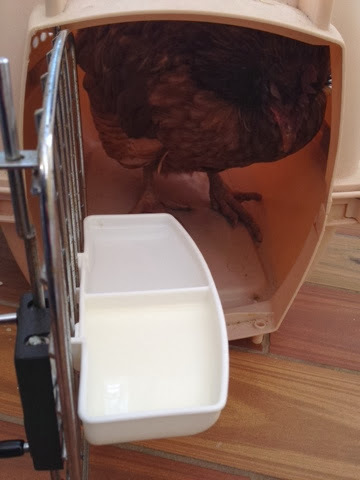 We don't know that she was actually sick since a mentor of ours seemed to think her symptoms were similar to those in a hen with an internal laying issue, but she was not doing well. We first noticed it a couple of days ago. She wasn't moving around much and stayed hunkered down with her feathers ruffled. Her apetite was decreased which is a tell tale sign that things aren't going well for any living creature. When I opened the coop today she was on the ground, under the roost bars and didn't move to eat at all. I brought her inside in a carrier, fed her some scrambled eggs (no worries, they are not fertilized. Purely nutrients) and left her in the heated bathroom for some warm, cozy rest. Ayden and I checked on her throughout the day. She didn't look good but not as bad either. But when David got home and checked on her, she had given up whatever fight she was fighting. From the beginning, we have understood that these hens are food, not pets, and we try to keep a detached mindset. We still take care of them though. We thank them for their eggs everyday, we enjoy their antics in the yard and the life that they have brought to our property. They have been another tangable step in the farming direction and will always be our first set of hens. This first loss does not go unrespected and I have a feeling that no loss ever will. These animals are food but they are so much more than that. They are part of our circle of life and we hold a place of high esteem because of that. Rest in peace little red hen. We will think of you every time we have to stop counting at 13. Flasback! Here's what we were up to one year ago today: "SOLD!" So sorry about your hen. I suppose it comes with the territory, but it is hard to lose any living thing that is under your care. 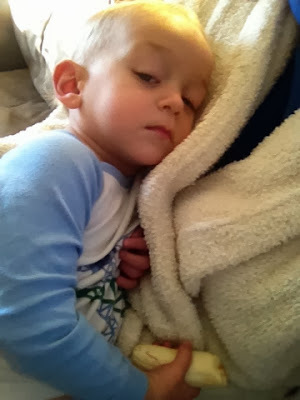 I hope Ayden is feeling well soon! He looks miserable in the photo above. Poor little guy.